Here are some resources for equipment “appropriate in scale” for the small grain and bean grower. 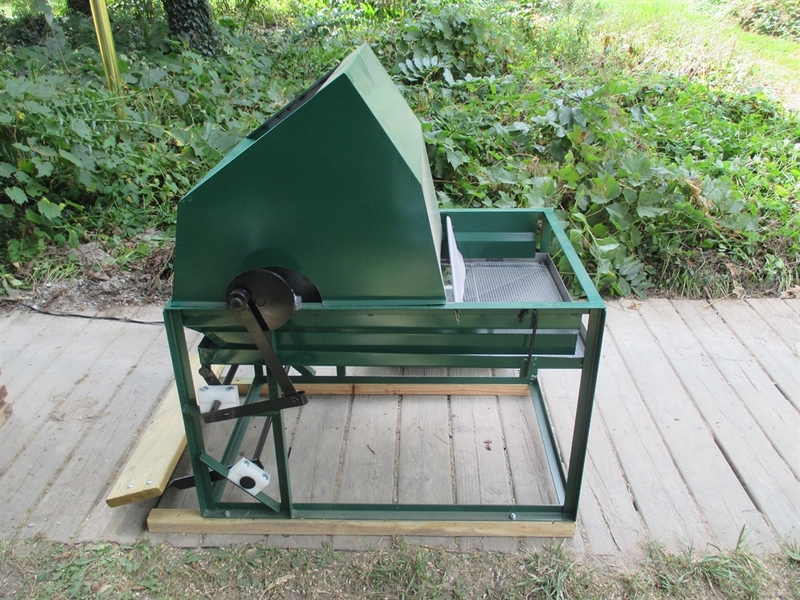 I have spent many hours researching inexpensive tools and equipment for harvesting, threshing, dehulling and cleaning seed crops like wheat, rice, peanuts, etc. What I have found is that living in the US has put me at a great disadvantage when it comes to small scale technology. Many of the most ingenious, simple agricultural tools are to be found in the emerging world. Unfortunately, they are difficult to import into the US and quite expensive when you consider shipping. Some forward thinking folks here in the US have appropriated some of these engineering designs and are building these types of equipment; offering them for sale or making the plans for construction available for free. 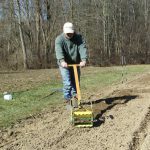 As more and more people look to growing all, or a portion of their own food, demand for these small-scale technologies and tools continues to increase. 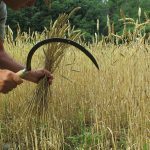 There are some great, high quality tools like scythes, flour mills, etc. manufactured here in the US or imported from Europe and other countries. 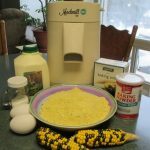 Before I suggest any equipment to purchase, the basic tools for processing your own homegrown grains and beans are probably already in or around your house. It is amazing how much you can accomplish with a simple house fan, a couple of buckets, a pillowcase and a piece of garden hose. For threshing grains and beans, you can place the dried bean pods or grain heads into a pillowcase. For beans you just lightly trample the bag with your feet and the beans will come free from the pods. For grains you need more of a flailing type force to beat the grain kernels free from the grain heads. I found that a 3 foot piece of rubber garden hose, bent in half and taped together (duct tape) at one end makes a great flail. 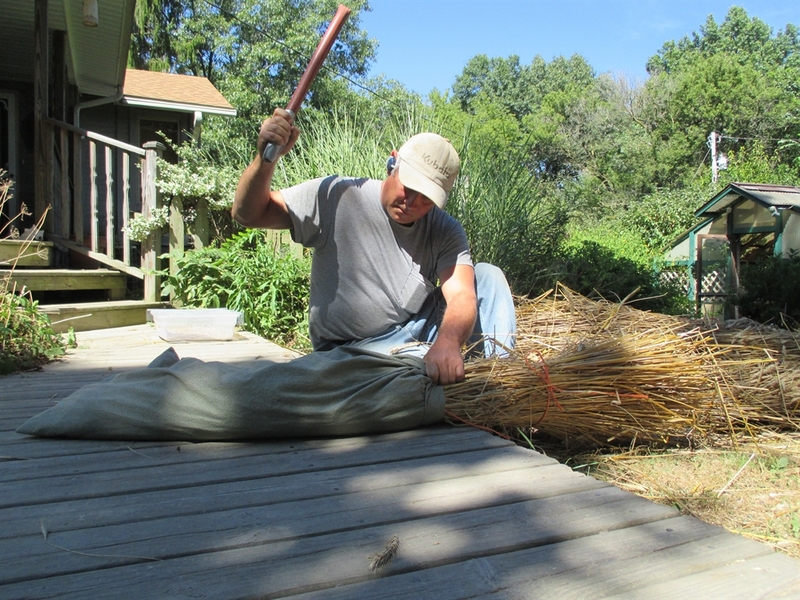 For winnowing (removing the chaff from the grain or beans), a simple house fan works great. Pouring your threshed beans or grains in front of the fan, from one bucket to another, will remove all the chaff and small, light pieces of plant material and bean pods. 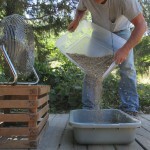 You may want to pour your grains over some type of screen to remove any sand or small stones. These do not blow away during the winnowing process. I purchased one of these machines 4 years ago from The Back To The Land Store. It has proven to be a real time saver for threshing cereal grains like wheat, barley, oats, rye, rice, millet and sorghum. It does not work well for tiny grains like teff and quinoa, neither is it suitable for threshing legumes. 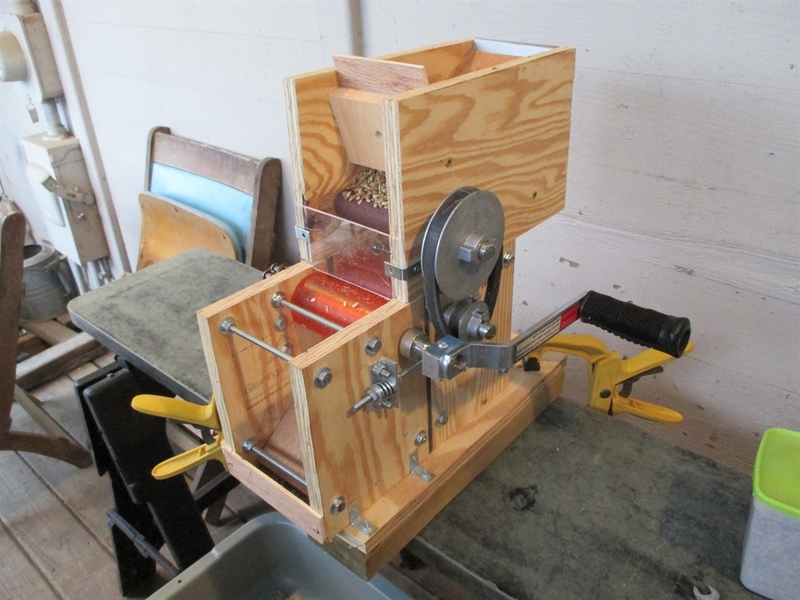 This small table top, hand-crank rice dehuller was designed and built by Don Brill of Brill Engineering. The complete plans are available online for free, including video tutorials. I have found that it works great for rice and millet. It does require multiple passes, but still saves an enormous amount of time compared to beating the rice in a mortar. The unit I have does not work for removing the hull from grains like Einkorn wheat. 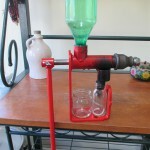 A hand crank oil press built in Holland. 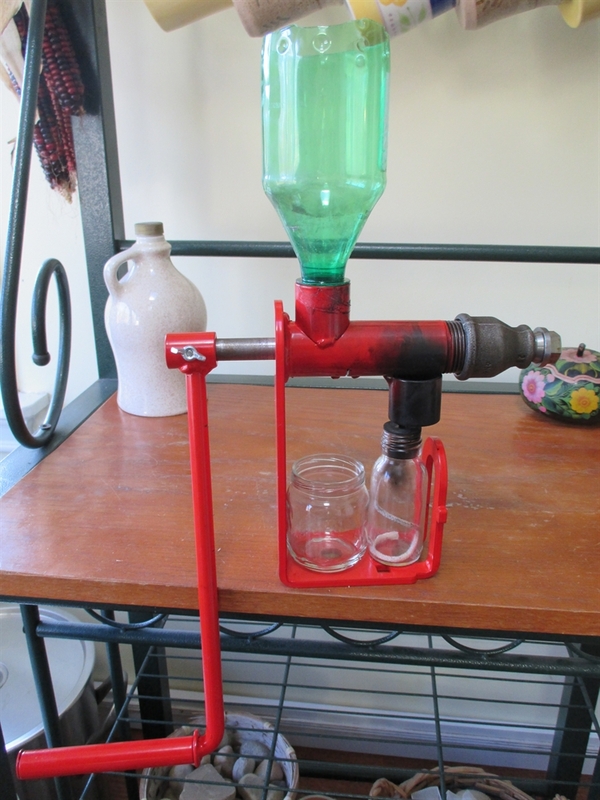 I have used this unit for expelling oil from sesame seeds, peanut seeds and pumpkin seeds. It works fairly well, but can be a bit temperamental depending on the air temperature and degree of moisture content in the seeds. For the price, it is hard to beat. There are a lot of sources online for this unit including Lehman’s and on Ebay. If you are going to be working with lots of different sizes of seeds to be cleaned, a screen set is essential. I have been extremely pleased with this set. It has made cleaning tiny seeds like amaranth, teff, sesame, etc. very easy. They also work great for removing sand and small stones from beans and grain. 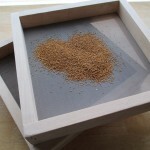 They are available finished in a cedar frame or you can purchase a set of just the stainless steel screens. I own both a scythe and a sickle. 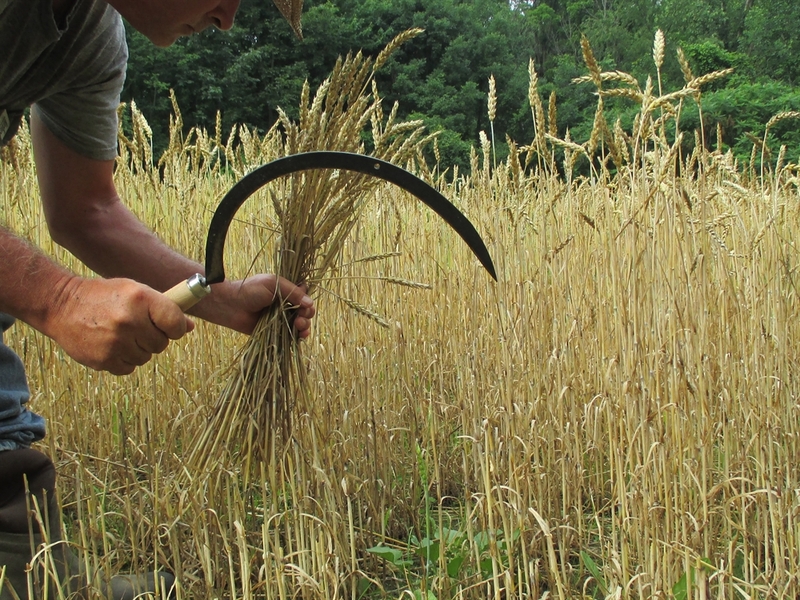 I have found that the sickle is the easiest for harvesting grains in small beds. For areas 1000 square foot and larger I employ the scythe. The scythe requires a lot of learning to use efficiently. Maintaining a sharp blade is critical and also requires special tools to do correctly. I did not purchase my scythe from One Scythe Revolution, but I have used this site for its information and videos. They sell what is called an Austrian Scythe. They also offer sickles and other hand tools as well as tools to keep your blades sharp. *One beneficial add on for a scythe is what is referred to as a grain cradle. I have “jury rigged” one for my scythe. 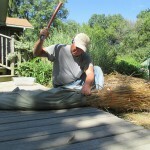 I helps to keep all of the grain stalks laying in the same direction once cut. This is very important for bundling grain sheafs that can be easily threshed. I have been using one of these for about 20 years. It works ok as a cultivator in beds free of rocks and with very loose soil. I have been using mine for beds where I have broadcast grain seed and cover crop seed. 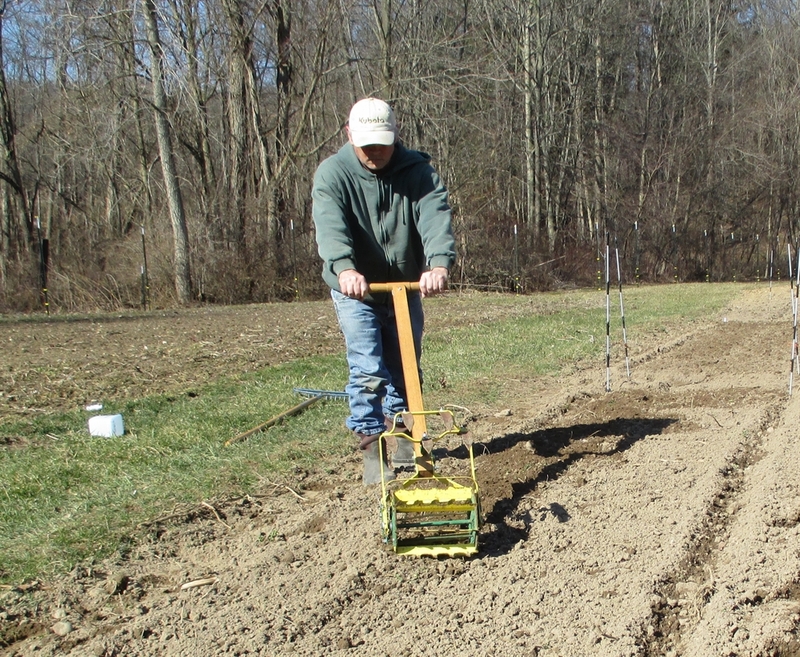 By flipping the unit over and rolling out on the soil where seed has been broadcast, it becomes a hand powered cultipacker, burying seed shallowly and leveling the bed. 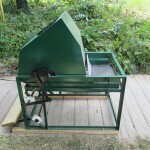 I have used both the Clipper motorized and hand-crank fanning mills for cleaning grain. These units were built in the 40’s and still worked fairly well. They use both air movement and gravity to separate grain from chaff and to remove lighter weight , diseased or underdeveloped kernels. 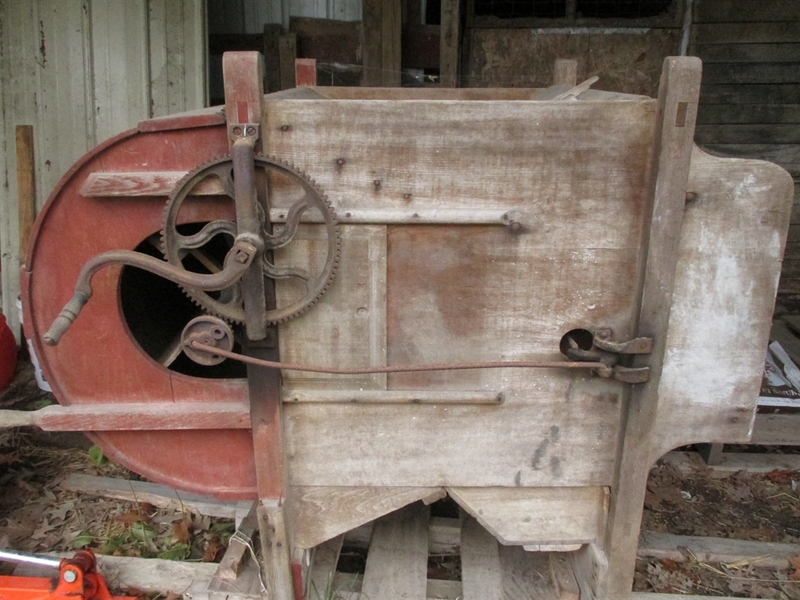 These types of mills are still available at farm sales and auctions. Be sure to find a unit with a good set of screens. New screens are still available but very expensive. Two options for consideration. 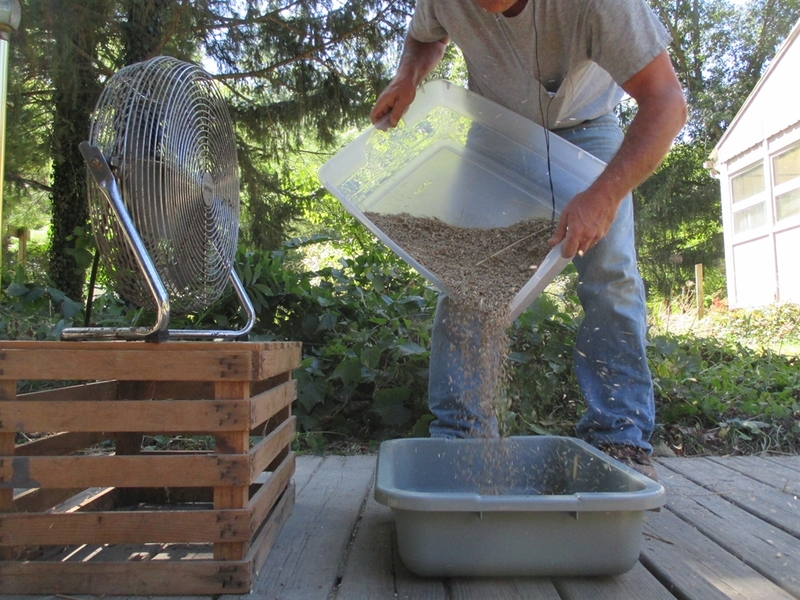 If you want to stay as inexpensive as possible, seed cleaning can be accomplished with a box fan and a couple of buckets or tubs. If money is not an option, might I suggest the Clipper Office Tester (roughly $3.000) at the link below. I am still saving my pennies for one of these. 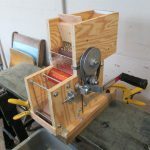 I started using this grain mill (Mockmill 100) in 2018. 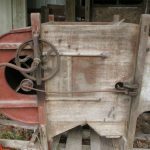 It is a excellent and simple to use stonemill and makes a variety of grinds from “very fine” flour to a “coarse grind” for grits and meal. 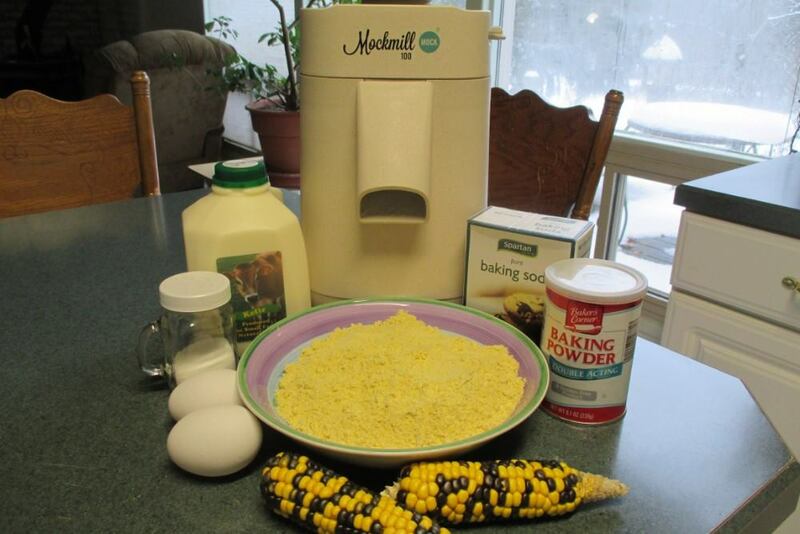 I have successfully processed wheat, barley, corn, rice and beans for a variety of breads and other delicious recipes. Very easy to adjust and clean. 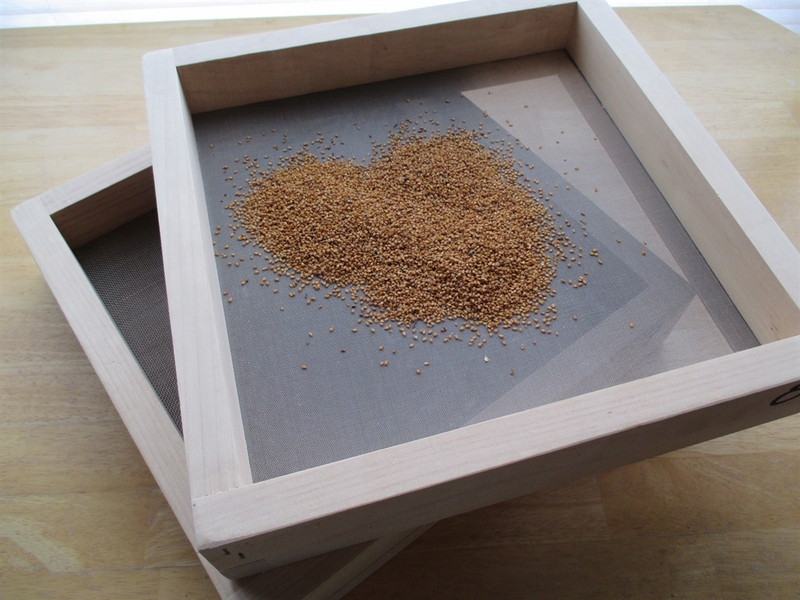 The perfect tool for milling your own homegrown grains in a modern kitchen setting. 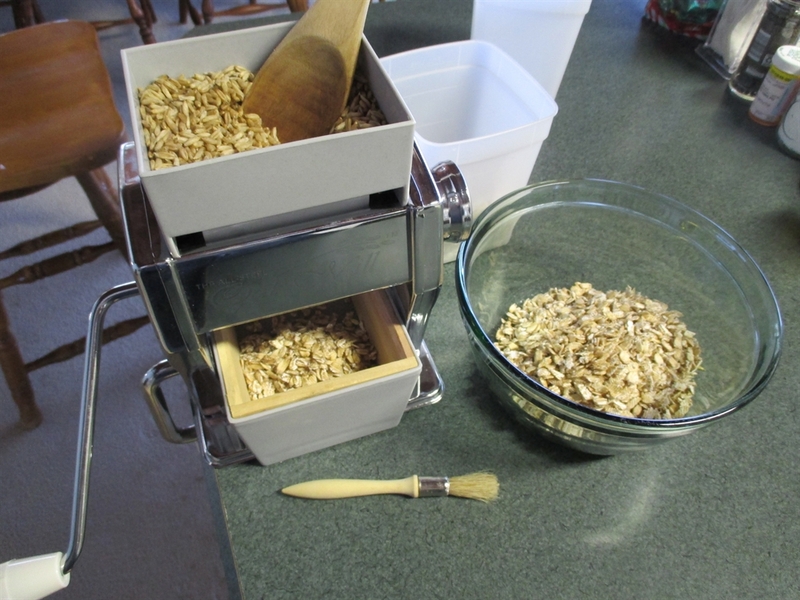 This little table top, hand crank kitchen tool is for turning your homegrown grains into grain flakes or for rolling. We use ours primarily to flake oats. 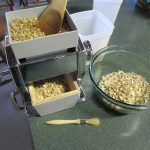 Fresh, homegrown oats make the best oatmeal, muesli and granola.The rollers are made from highly tempered steel and not aluminum. Aside from oats, it can roll wheat berries and rye berries. This one is not exactly low-tech or traditional, but it is super easy and not very expensive. Once I fell in love with growing soybeans, I had to figure out what to do with them. 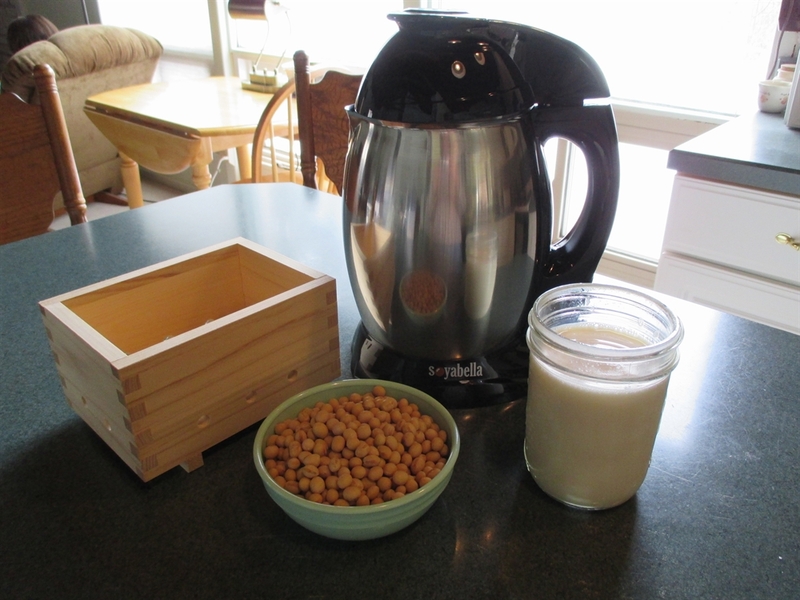 This table top machine makes fresh soymilk in about 20 minutes. 15 minutes later I can have a fresh block of tofu. 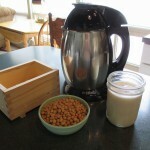 It can also make peanut milk, sesame milk, almond milk and rice milk. The little box to the left is a Mitoku Tofu Press, made out of cedar wood and imported from Japan. It comes as a kit with everything you need to make fresh tofu. Tillers is an organization dedicated to improving the lives of people in rural areas around the globe by teaching traditional and low-tech methods of farming as well as homesteading and artisanal skills. Their facility at Tillers’ Cook’s Mill Learning Center in Scotts, MI , holds numerous workshops. These classes support their work with farmers overseas. Ecology Action, a project started by John Jeavons over 40 years ago, designed to teach people biointensive farming techniques here in the US and overseas. In addition to their philanthropic efforts, they also put out a seed catalog called Bountiful Gardens. This is a wonderful resource for books and pamphlets dedicated to small-scale farming, gardening and homesteading, with an emphasis on staple crops. They also have a great selection of tools, supplies and seed.